Three people were taken in for questioning by Police on Tuesday for allegedly breaching the Electoral Decree 2014. 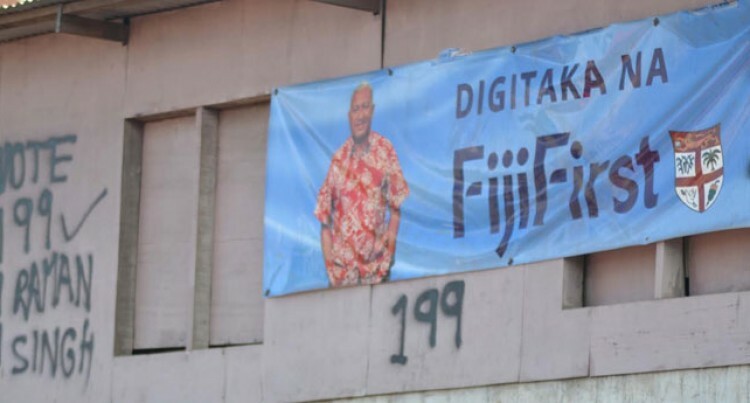 The three were alleged to have vandalised a banner belonging to FijiFirst that was posted on the wall of a building in Labasa Town. They received a report from a member of the party’s Labasa branch that their banner had been covered with another party’s banner. “Numbers were also written in black paint beside the political party’s banner,” Mr Tudravu said. Two more people are expected to be brought in for questioning. Meanwhile Gold Hold Building owner Suka Singh said it was his building and he could do anything to it. “The other parties asked me if they could paste posters on my building for a rally last week Saturday so I said go ahead,” Mr Singh said. “I don’t know why Police are keeping those three men from National Federation Party (NFP) in Police custody when I was the one who approved it. “If Police want to charge anyone they should charge me, the party wanted to use my building so I agreed,” he said. Police have conducted their initial investigations and the matter will be handed over to Fiji Independent Commission Against Corruption. Meanwhile, a report of another alleged breach of the Electoral Decree was received at the Nasinu Police Station. The Police report states that a candidate upon checking on his banner which was posted on the wall of a supermarket complex found it missing and replaced by another candidate’s banner. The discovery was made on Tuesday and Police investigations are continuing.